Samsung's Galaxy A-Series for mid-range phones now offers a higher option. It's called Samsung Galaxy A70, and the 6.7-inch notched display has an aspect ratio of 20: 9. The screens of mobile phones are getting bigger, and the A70 wants to follow the trend while sitting comfortably on the phone as wider. More screen space on the A70 means more material will fit on the screen without scrolling. The Xperia 1 and Xperia 10 phones from Sony use an even higher, thinner aspect ratio of 21: 9, but Samsung offers a larger screen here. 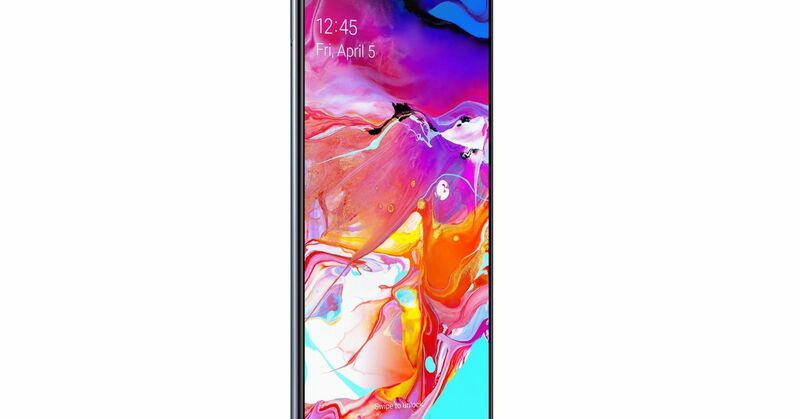 The new A70 looks virtually identical to the Galaxy A50, which was announced at the MWC in February. Both have a three-lens camera system on their backs. Both also use Super AMOLED displays, and their glossy backs are what Samsung calls "3D Glasstic." However, thanks to the larger aspect ratio, the A70's screen almost reaches the bottom of the phone. Inside, it surpasses the rest of the Samsung A-Series phones by starting with 6GB of RAM and a huge, 4500 mAh battery. Both the A70 and the A50 have an in-display fingerprint sensor found in Samsung's Galaxy S10 and S10 Plus. This feature in Samsung's flagship phones has not worked very well, and overall, the in-display sensor feels slower and more picky than sensors in the rear. It's hard to imagine that the results of a cheaper phone could be better, but we reserve the verdict until it's published. No pricing and release dates have been announced for A70, but Samsung is expected to provide more details on its awkward "A Galaxy Event" on April 10th.